The United States governments through the US Agency for International Development, USAID, and Ecobank Cameroon have signed a partnership to mobilise 3.7 million US dollars, approximately FCFA 1.8 billion to finance small and medium size enterprises working in the health sector for the next eight years. 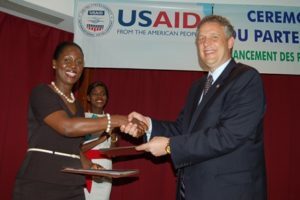 The Deputy Chief of Missions at the US Embassy, Mathew Smith signed on behalf of USAID, while Gwendoline Abunaw, the Executive Director of Ecobank signed for her financial institution. The financial assistance will be made available through loans to health SMEs and NGOs which provide family planning, reproductive health and maternal health services or products. Signing the partnership, Mathew Smith said through the partnership, USAID, will promote health for women and children in Cameroon. “By helping small and medium health enterprises gain access to loans, they will purchase equipment, expand facilities and improve supply chain management and service delivery,” he stated. To the diplomat, in the quest for universal health access, private sector engagement and mobilisation of domestic resources are essential to improving the supply side of health care services. “Engaging the private sector can unlock millions of FCFAs to support not only growth in the health sector, but also the overall economic growth of Cameroon. Assessment from a USAID funded project known as Strengthening, Health Outcome through Private Sector, SHOPS, showed that in 2014, private sector facilities accounted for 40 percent of all hospital patients visit. In addition, the 2011 Cameroon Demographic and Health Survey indicated that up to 77 percent of family planning users cited the private sector as their source of modern contraceptives. It is therefore imperial for the USAID to partner with Ecobank,” he said. He further stated that the goal of USAID investments in such a project is to improve quality healthcare and better outcomes by developing borrowers’ capacity for business and financial management, governance, leadership and loan management. To Gwendoline Abunaw, Ecobank Cameroon will make more loans available for working and investment capital to qualifying borrowers such as private retail pharmacies, hospitals, clinics, diagnostic laboratories, medical training facilities and other private sector enterprises, while USAID will prove technical assistance to borrowers. “Borrowed funds will finance crucial areas such as equipment purchase, capacity building, facilities upgrade and expanding supply chains and health services,” she stated. Abunaw said the initiative supported by her Pan African Bank falls within the commercial bank space policy of the institution which seeks to help SMEs as a method of contributing to the financial and economic advancement of the country. She added that her institution is greatly involved in improving the health and livelihood of Cameroonians as seen in their project for the distribution of mosquito nets to some beneficiaries and providing of assistance to some orphanages in Cameroon. Pr. Ekoe Tetanye, who owns a private clinic in Yaoundé, bemoaned the several challenges accessing banks loans for investment in the country and prayed on banks to relax their borrowing policies as well as interest rates.